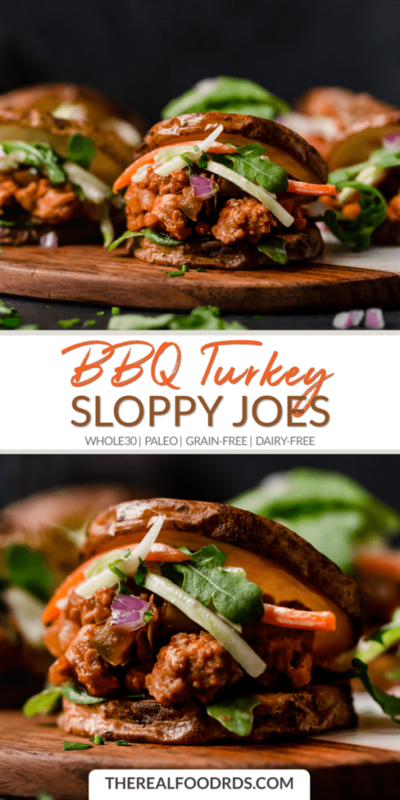 Slide over run-of-the-mill appetizers…these Whole30-friendly BBQ Turkey Sloppy Joes are about to take center stage! This post was created in partnership with our friends at The New Primal. With the holidays winding down and the new year quickly approaching we’ve all got healthy eating on the brain. We’ve also got party appetizers on the brain too, what with New Years Eve party invites starting to roll in. So what’s a healthy eater to do? Do you delay your resolve to get back to regular, nourishing meals so you can enjoy the party food? Do you pack a Tupperware with carrot sticks or other bird food to hopefully keep your mind off the munchies being served? Heck no! You do neither. 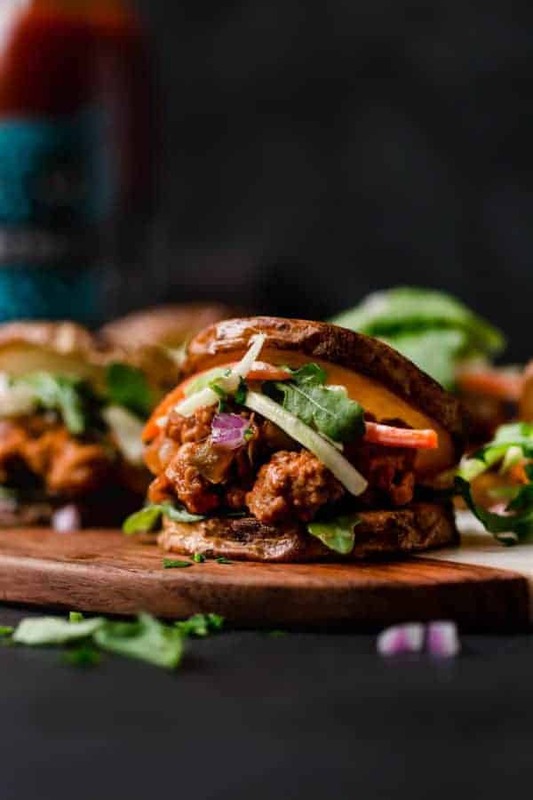 In fact, we believe that you should never have to compromise taste for health which is why we’ve got yet another healthy comfort food recipe for you today – so you can have your BBQ Turkey Sloppy Joes and enjoy the heck out of them too. Even if you’re on a Whole30, avoiding gluten/dairy/eggs/nuts, etc. So without further ado, let’s see just how simple these are to pull together with less than 10 ingredients. You can serve them as a hearty party appetizer or enjoy them for an easy weeknight meal (or even prep them ahead during your next weekly meal prep session). Who doesn’t want better buns? Be it in your favorite workout tights or on your plate, swapping out a refined carb bun for crispy-on-the-outside-tender-on-the-inside slices of potato means you get more nutrition bang for your buck. A good source of vitamins C and B6, potassium, magnesium, fiber, resistant starch, and antioxidants. Sure, you can use sweet potatoes for the buns (as we did for those Stovetop Sloppy Joes, these Buffalo Chicken Sliders, these Slow Cooker Chicken Sloppy Joes, or these Slow Cooker Citrus Herb Pork Sliders with Pineapple Salsa Slaw), but a good old Russet potato works beautifully too. Bottom line: Use what you’ve got on hand, what you like and/or what’s in your budget or available to you. 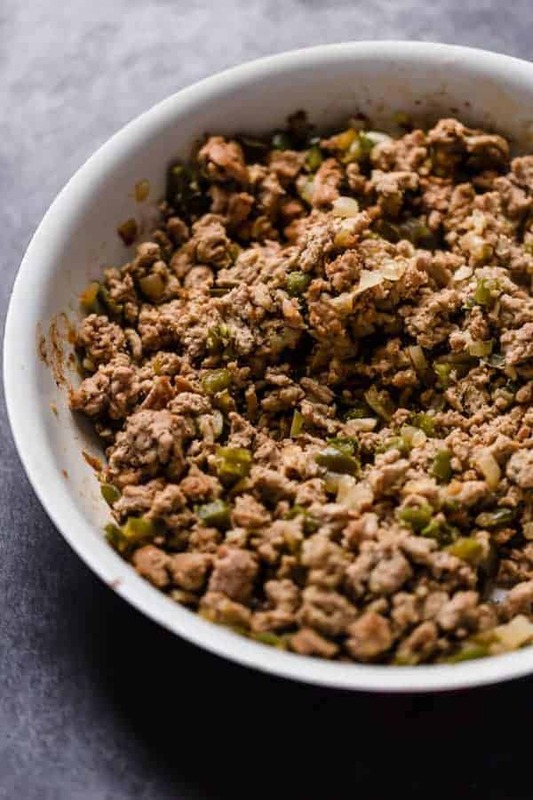 We’ve swapped out the traditional ground beef for lean ground turkey in this recipe, but you can certainly use ground beef or ground chicken. Both will be delicious and the perfect protein-rich vehicle for the tangy, savory sauce that starts with your favorite barbecue sauce. 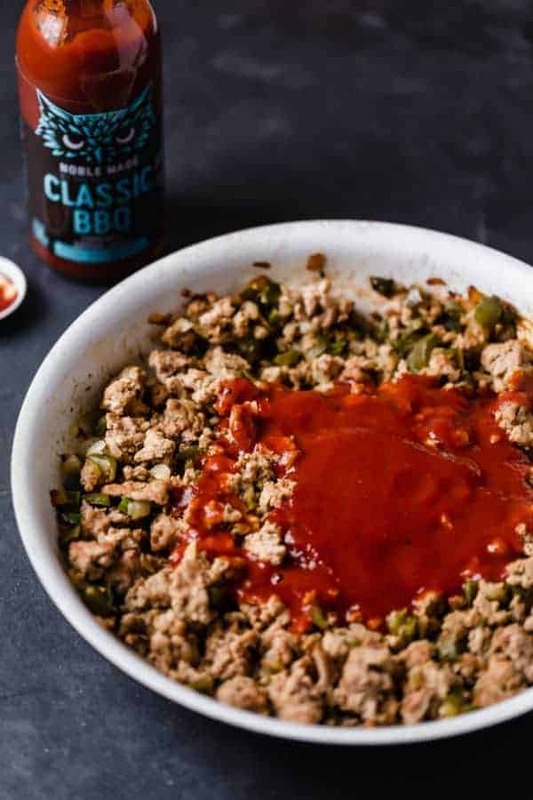 For these BBQ Turkey Sloppy Joes, we used The New Primal Classic BBQ Cooking & Dipping Sauce because it’s, well, amazing. Being that Stacie and I are both barbecue fanatics we don’t take BBQ sauce lightly. It has to be tangy, lightly sweet, slightly smoky and good on everything. This sauce fits all of those criteria and more: Whole30-approved, no refined sugars, organic, certified gluten- and dairy-free. It’s sweetened with pineapple and tamarind concentrates and has the added bonus of being made with bone broth. Oh, and it’s freaking delicious. If it wasn’t, you can be sure we wouldn’t be using it because life is too short to not eat delicious things, amirite?! Here’s another not-so-secret fact about us – a generous dollop of cool and creamy slaw of some kind is pretty much mandatory when we’re talking about barbecue. 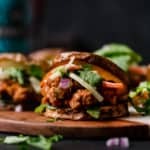 Case in point: this Instant Pot BBQ Pulled Chicken with Simple Slaw, these Sonoran Hotdogs with Mexi Slaw, this Slow Cooker BBQ Beef with Cole Slaw, and this Slow Cooker BBQ Peach Chicken with Slaw). Clearly, it’s a killer combo so we’ve included a recipe for an ultra-simple, 4-ingredient slaw that can’t be beaten and makes everything BBQ a thousand times better. OK, one more time. This time a little closer. 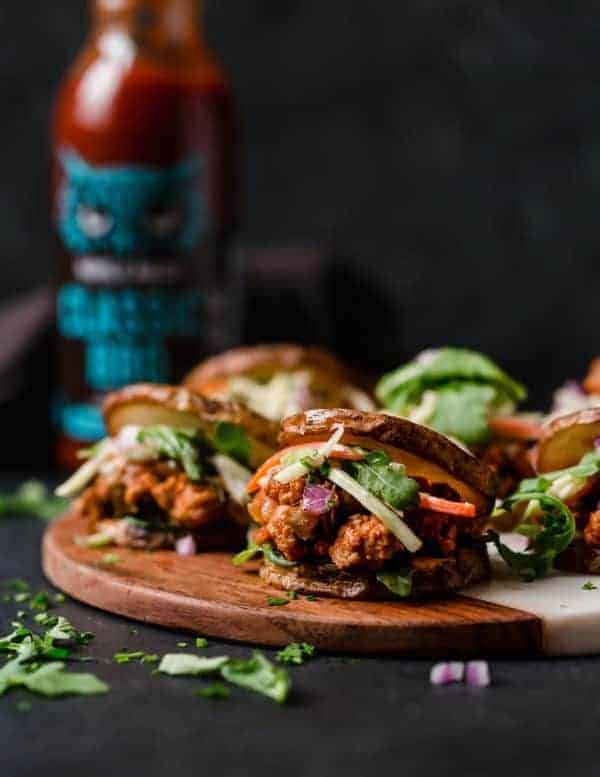 Now, how can you say no to these BBQ Turkey Sloppy Joes when there’s so much flavor packed into such a cute little bite?! You can’t. So ditch the idea of skipping the appetizers on New Year’s Eve (or the Superbowl, or your next housewarming, or anytime, really) and whip up a batch of these instead. 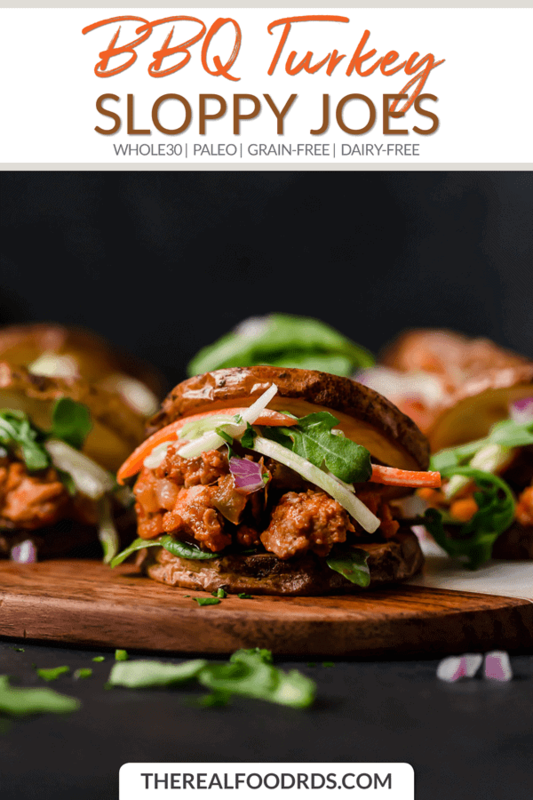 These tasty Whole30-friendly BBQ Turkey Sloppy Joes can be served as a hearty party appetizer or satisfying weeknight dinner. And with just a handful of ingredients, they’re easy to whip up whenever that BBQ craving strikes. Preheat oven to 375℉. Line a large rimmed baking sheet with parchment paper and set aside. Wash and dry potatoes. Cut into 16 slices (¼ – ½-inch thick). 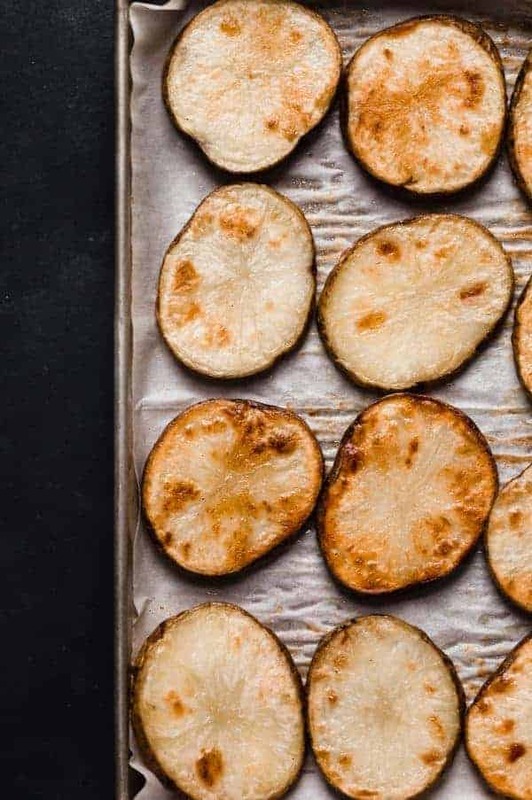 Toss potato slices on a baking sheet with oil and arrange in a single layer. Bake 15-25 minutes or until tender and lightly browned. Remove from oven and set aside. Place a large skillet over medium-high heat (medium if using cast iron). Add oil and when oil starts to shimmer, add diced peppers and onions. Cook, stirring occasionally, 7-8 minutes or until vegetables start to soften. Add garlic and cook an additional 30 seconds or until fragrant. Add ground turkey. Use a large spoon to break up turkey and cook until meat is almost cooked through. Add tomato paste, BBQ sauce, and water. Reduce heat to a simmer, cover, and cook stirring occasionally, for 10 minutes until turkey is cooked through and sauce is slightly thickened and hot. Taste and season with salt and pepper as desired. Place broccoli slaw in a bowl. In a smaller bowl, combine mayonnaise, apple cider vinegar, and garlic powder. Add salt and pepper to taste then toss with broccoli slaw. Place a few spinach or arugula leaves on each of the potato slices then divide sloppy joe mixture evenly among the 8 rounds. Top with slaw and thinly sliced red onion. Sprinkle with chopped parsley and top with another potato round. Skewer with a wooden pick, if desired. What’s your favorite hearty appetizer? What makes it a favorite – easy to prepare, tasty, etc.? Share in the comments below!